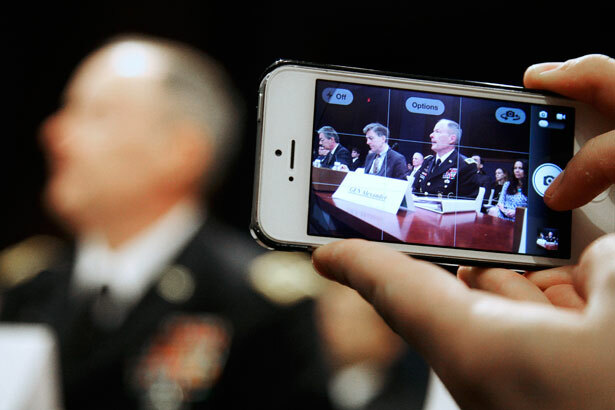 Is Congress moving towards putting a real check on the executive branch’s spying power? Senator Ron Wyden’s speech at the Center for American Progress on Tuesday morning was a pivotal moment in the emerging debate over domestic surveillance—the senator, who was one of the first to warn the public that the government was interpreting the Patriot Act in a “shocking” fashion, issued yet another important warning. Without immediate action to address an ever-expanding surveillance state, the country risks entrenching an apparatus that “cannot be reversed,” he said. The Patriot Act and the subsequent expansion of its authority by both Congress and the secret Foreign Intelligence Surveillance Court has led to “the creation of an always-expanding, omnipresent surveillance state that, hour by hour, chips needlessly away at the liberties and freedoms our founders established for us, without the benefit of actually making us any safer,” he said. Wyden wants the administration to disclose the FISC opinions that have created a secret body of law governing domestic surveillance by the NSA. He has co-sponsored a Senate bill to that effect, and repeatedly hammered at the problem of secret laws in his speech. The speech offered an elevated platform for that demand, but also came at a pivotal time in Washington, as real signs of action towards curbing domestic surveillance are beginning to materialize. Before Wyden took the stage, John Podesta—a former chief of staff to Bill Clinton and a well-respected figure in the Democratic apparatus in DC—called for a presidential-level commission to evaluate laws around domestic surveillance and data-gathering, both by the government and private companies. And across town on Tuesday, Congress was also preparing for the first real legislative challenge to the NSA’s surveillance power as we understand it now, post–Edward Snowden. Representative Justin Amash created an amendment to a defense appropriations bill that would strip funding for the NSA (which is part of the Pentagon) to conduct broad, dragnet surveillance of American citizens. It would leave in place funding for surveillance of specific communications and records of a non-US person that is under investigation, which is how most people originally understood the government’s authority under the Patriot Act. The House Rules Committee said Amash’s amendment is in order, which means it will get a full debate on the floor of the House of Representatives this week, likely starting Wednesday evening. The amendment is already gaining bipartisan support, notably from Representative John Conyers, the ranking member and former chair of the House Judiciary Committee. The NSA is apparently concerned enough about passage that it immediately dispatched NSA Director Keith Alexander to Capitol Hill to hold a closed-door, top-secret briefing with lawmakers. Also, pro-surveillance members of the House employed a classic legislative subterfuge to try to slow down Amash’s amendment: Representative Richard Nugent introduced what appears to be a similar, alternative amendment defunding NSA’s bulk collection. But as Mike Masnick of TechDirt explains, the amendment’s language is constructed in a way that only reinforces existing authority, and provides only the superficial appearance of an “alternative” to Amash’s bill. This fact was acknowledged—albeit begrudgingly—by other House members last week during an unusually contentious House Judiciary Committee hearing with officials from the Department of Justice and the NSA. “Snowden, I don’t like him at all, but we would’ve never known what happened if he hadn’t told us,” said Representative Ted Poe. Earlier in the hearing, Representative James Sensenbrenner told the officials point-blank they might lose much of their authority to conduct surveillance under the Patriot Act—a statement that didn’t draw a ton of attention, but foreshadows a serious congressional check on the administration’s authority if Sensenbrenner is right. Senators Jeff Merkley and Mike Lee co-sponsored a bill on June 11 to declassify FISA court documents, which Wyden co-sponsored. Senator Rand Paul (R-KY) introduced S.1121 “Fourth Amendment Restoration Act,” “A bill to stop the National Security Agency from spying on citizens of the United States and for other purposes,” introduced on June 7. It would require authorities possess a warrant based on probable cause in order to conduct surveillance. Representative Adam Schiff proposed legislation that would require FISC judges to be nominated by the president and confirmed by the Senate, while maintaining the seven-year term limit for FISC appointments. Representatives Rick Larsen and Justin Amash introduced HR 2736, the “Government Surveillance Transparency Act of 2013,” on July 18, which create ninety-day reporting requirements for surveillance under the Foreign Intelligence Surveillance Act. Representative Steve Cohen introduced HR 2586, the “FISA Court Accountability Act,” on June 28 “to strengthen privacy protections, accountability, and oversight related to domestic surveillance conducted pursuant to the USA PATRIOT Act and the Foreign Intelligence Surveillance Act of 1978.” A chief provision of this bill would give Congress the authority to appoint FISC judges. Supreme Court Chief Justice John Roberts currently has that sole responsibility. Senator Patrick Leahy introduced S 1215, the “FISA Accountability and Privacy Protection Act of 2013,” on June 24 “to strengthen privacy protections, accountability, and oversight related to domestic surveillance conducted pursuant to the USA PATRIOT Act and the Foreign Intelligence Surveillance Act of 1978.” It would chiefly heighten the evidence requirements needed for surveillance under FISA. It is co-sponsored by Senators Mike Lee, Mark Udall, Ron Wyden, Richard Blumenthal and Jon Tester. Representative Sheila Jackson Lee (D-TX) introduced HR 2440, “FISA Court in the Sunshine Act,” on June 19. “To require the Attorney General to disclose each decision, order, or opinion of a Foreign Intelligence Surveillance Court that includes significant legal interpretation of section 501 or 702 of the Foreign Intelligence Surveillance Act of 1978 unless such disclosure is not in the national security interest of the United States and for other purposes.” This is essentially the same as the Merkley-Lee bill in the Senate. Representatives Adam Schiff and Todd Rokita (R-IN) introduced legislation June 20 much like Jackson-Lee’s amendment, and the Merkley-Udall effort in the Senate, and would require disclosure of relevant FISC opinions. Senator Mark Udall sponsored S 1182, “A bill to modify the FISA Act of 1978 to require specific evidence for access to business records and other tangible things, and provide appropriate transition procedures, and for other purposes,” on June 18 limiting the federal government’s ability to collect data from Americans. Nation DC intern Samantha Lachman provided research assistance for this article.